Press Release. Palliative care: an across-the-board commitment in the Catholic world and beyond! Tirana, Albania, March 18, 2019. The Pontifical Academy for Life’s commitment to palliative care is «across the board», with conferences (the next in Brazil and Rwanda), ecumenical appointments, publications, and academic training. On Monday, March 18th, at the Faculty of Medicine of the Catholic University Nostra Signora del Buon Consiglio (Our Lady of Good Counsel University) in Tirana, Msgr Vincenzo Paglia, President of the Pontifical Academy for Life, illustrated the stages of the Academy’s commitment to promote the spread of a culture of palliative care around the world. He spoke on the theme of being «against the culture of waste, in exchange for a culture of love, and palliative care as the promotion of a culture of social responsibility». Msgr Paglia underlined that the commitment to this theme responds to Pope Francis’ 2015 mandate, when he received the Academicians and said that «palliative care (…) values the person». Therefore, the Pontifical Academy with the Pal-Life Project has already «realized several international events: in Houston, U.S.A; in Doha, Qatar; and in Rome and Milan, Italy. Next May there will be a meeting in Brazil for program implementation in Latin America; in late September another meeting in Rwanda to address the issue on the African continent». 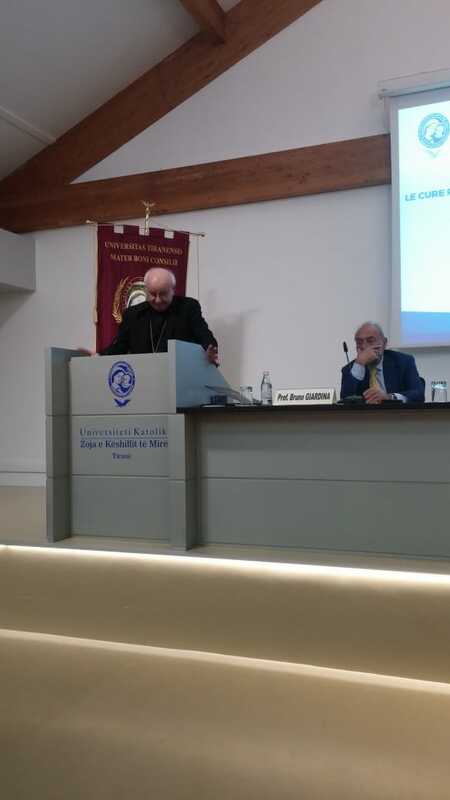 There is also – added Msgr Paglia – «an aspect that I think should be emphasized, namely palliative care in the ecumenical and inter-religious context. Two joint declarations have already been signed between the Pontifical Academy for Life and the American Methodist Church, and with the Qatar Foundation. A further inter-religious declaration is being drawn up with the Jewish and Islamic religions. A new alliance between faith and humanism allows us to affirm that human life, even when it is fragile and apparently defeated by illness, contains an intangible preciousness. Palliative care embodies a vision of man that is profoundly religious and at the same time profoundly human. In my opinion, this perspective is the true soul and the true strength of palliative care». Furthermore, during the meeting Msgr Paglia made the first public presentation of the «White Book» on palliative care «which will be sent to Catholic universities and hospitals around the world to help with their awareness of the concept and its implementation. We want to promote a palliative culture, both to respond to the temptation of euthanasia and assisted suicide, and above all to develop develop a culture of care that allows us to offer an accompaniment of love until one’s death». The terminal patient is never incurable, concluded Msgr Paglia. «Never, therefore, should we abandon the sick, even when the possibility of recovery is lacking, and we know well how palliative care has been the protagonist of recovery, through its integral accompaniment of the patient in the sphere of contemporary medicine».